Production of gold has more than tripled from the 23.5 metric tons recorded in 2000 to 88.6 metric tons in 2012, 3.2% of world production, 5.3% more than the previous year, and the ninth consecutive year-on-year increase. Analysts believe that gold production will double again between now and 2020. Mexico is the world’s 11th largest producer of gold, well behind China (13% of world total), Australia (10%) the USA (9%) and Russia (7%). Mexico exports gold, mainly to the USA and Switzerland. The vast majority of gold and silver production in Mexico comes from a handful of major corporations, led by Canadian mining firm Goldcorp, whose main mines are at Los Filos (Guerrero) and Peñasquito (Zacatecas). 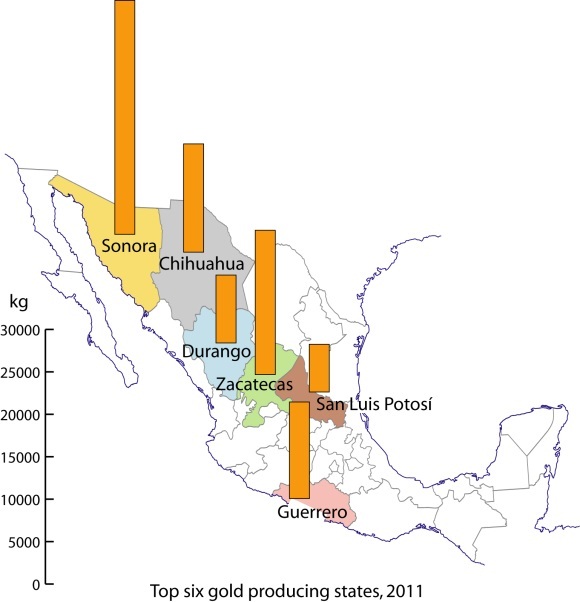 The map shows the six main gold mining states in Mexico. Production in Sonora has grown rapidly in the past decade and that state is now responsible for 32% of national production, ahead of Zacatecas (20%), Chihuahua (15%), Guerrero (13%), Durango (9%) and San Luis Potosí (7%). We will explore the controversy surrounding Goldcorp’s Los Filos opencast mine in Guerrero, billed as Latin America’s largest gold mine development, and some other mining controversies in Mexico, in a future post.